The MEGATRON® MT-MM stands out due to the following advantageous qualities compared with conventional emulsifying methods. Low mechanical and thermal load of the product: Due to the fact that the drop formation is not primarily based on high shear forces or bounce effects a very gentle processing of the product is possible. At the membrane emulsifying process, the thermal and mechanical loads having an effect on products are lower than at conventional emulsifying methods around orders of magnitude. Double emulsions: The production of double emulsions is without problems possible by the gentle emulsifying process. High concentration of contents: By the system of it is possible to produce emulsions with up to approx. 50 % ratio of the disperse phase in one step – defined and reproducible. The emulsions arising in this process show also spatially very constant distributions of concentration. Low energy consumption: Due to the proportionally low energy which is necessary to receive a certain emulsifying result is also the energy consumption and with that the energy costs related to a produced output much lower. Small droplet sizes: Since the membrane pores show only a diameter of 1 – 2 μm, it is possible to produce very small droplets. Depending on speed droplets also can be produced due to the special drop formation mechanism in the sub micron area. Narrow droplet size distributions: Because of the special drop formation mechanism very narrow droplet size distributions can be reached. It is also possible at certain applications and process parameters to produce monodisperse emulsions practically. Controllability: The system MEGATRON® MT-MM works after the inline principle. Desired throughputs and droplet size distributions can reproducibly be well controlled. 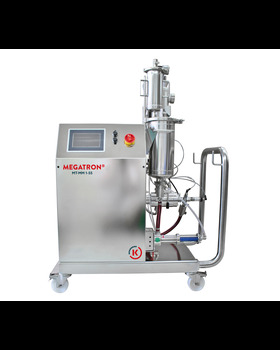 A MEGATRON® MT-MM machine consists in principle from a cylindrical working chamber in which one a membrane is installed coaxially over a shaft. The working chamber has two product inlets, one for the disperse (inner) phase and one for the continuous (outer) phase. The disperse phase streams axially into the inside of and will be dispersed into the continuous phase while flowing through the pores of the membrane. The drop detachment is additionaly supported by the fast rotation. The drop formation or its size distribution depends on the process parameters: Speed, pore diameter of the membrane, viscosity of the continuous phase and the shear gap. The formed drops are taken away continuously by the outer phase.